In Cooking from Every Angle, we hear from our fearless leaders: Food52 co-founders Amanda & Merrill. Today: The back-pocket recipe you'll want on hand always, and especially in case of dinner party emergency. I’ve long been preaching that one can never be too prepared for a dinner party. I write menus and grocery lists; my husband, Tad, makes a seating chart; I even set out all of my serving dishes and label them with sticky notes. Wait, I know what you’re thinking! I’m fun, I swear! And, seriously, there’s a difference between being an uptight host and a prepared host who can let loose once the guests arrive. I let my anxious freak flag fly in advance, and then shut it down when the doorbell rings. One of my die-hard strategies has been to serve a main course that can be prepared one or two days before the party and warmed to serve. In the cooler months, short ribs often find their way onto our dinner party menus. I did once have a snafu with short ribs, but thought I’d learned my lesson. But then for another dinner party more recently, I made Mario Batali’s Beef in Barolo, using short ribs I’d ordered from a new source. The dish smelled delicious but the ribs took forever to soften. I gave them two extra hours, then decided it would be better not to overcook them. So I cooled them in their pot, put it in the fridge, and moved on to the rest of the party prep over the next two days. An hour before the party, I reheated the short ribs on the stove. Nervous, I asked Tad to taste them. He tends to like most things I make. “You can’t serve this,” he said bluntly. The beef was like shoe leather; the sauce had cooked down to a bitter concentrate. Tad had roasted potatoes. I had a brief moment of lunacy: Okay, we’re serving roasted potatoes for the main course. I never cook things last-minute for more than 6 people. We had 10 coming for dinner! Tad smartly exited the room while I gnashed my teeth. This is when it’s okay to open the wine a little early. 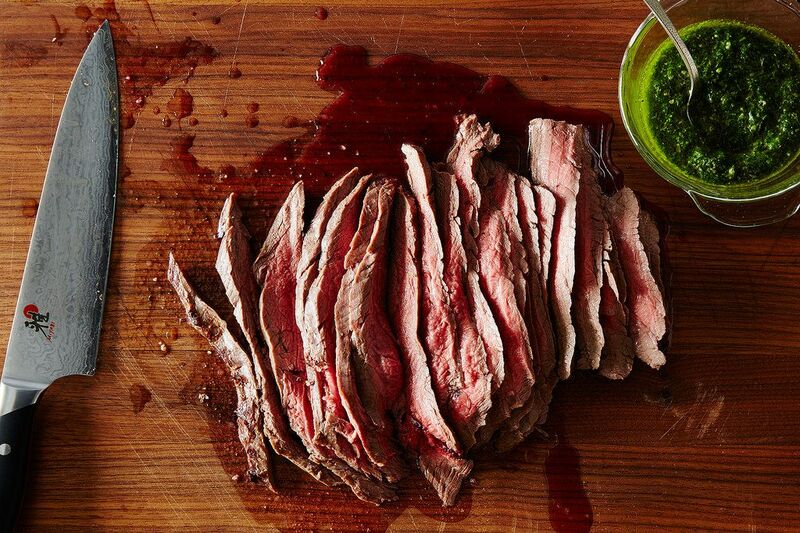 I turned to a dish we often make on the weekends: flank steak with green sauce. Tad ran out to the butcher and picked up steaks while I cobbled together parsley, a few herbs, garlic, capers, and red pepper flakes and blended them up into a bright and tangy sauce. While our guests ate hors d’oeuvres, the steaks sat, seasoned, warming to room temperature. Then I broiled them, and because I’d already failed, I didn’t have any worry about overcooking the steak—how much worse could things get? The steak was delicious and our friends used the potatoes to lap up every last bit of green sauce. By force, I got over a dinner party fear, and learned a solid lesson for the future: Always have a back-pocket dish at the ready. Steak with green sauce will be mine for years to come. Not that I ever! Ever! Ever! Plan to mess up short ribs again. See the full recipe (and save and print it) here. 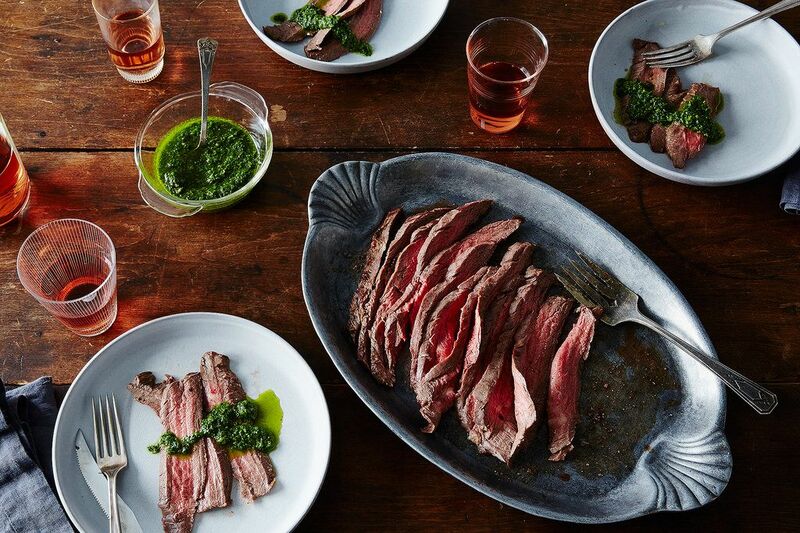 A New Way to Dinner, co-authored by Food52's founders Amanda Hesser and Merrill Stubbs, is an indispensable playbook for stress-free meal-planning (hint: cook foundational dishes on the weekend and mix and match ‘em through the week). See what other Food52 readers are saying. Before starting Food52 with Merrill, I was a food writer and editor at the New York Times. I've written several books, including "Cooking for Mr. Latte" and "The Essential New York Times Cookbook." I played myself in "Julie & Julia" -- hope you didn't blink, or you may have missed the scene! I live in Brooklyn with my husband, Tad, and twins, Walker and Addison. Sub suggestion for anchovies, else just omit? Yes, you can just omit. Actually the short rib recipe that I used was one I make at least 4 times a year and have done so for the past 10 years. It wasn't the recipe - it was that the meat. It never got tender. Hmm -- I really don't know. Were the short ribs covered in liquid for the full cooking time? It could be that the meat was very lean, but even then, they should have gotten tender if cooked long and slow. I had the same problem with short ribs. It was awful. Any idea why? Hi Margotk, which short ribs recipe are you referring to? Let me know. Slow cooker = 8 hours? Pressure cooker = maybe 40 minutes! And fall off the bone meat! And you can sit back and sip some wine! My husband does the pressure cooking, as my childhood memories include that steam clattering weight and my mother yelling clear the kitchen!! I still stand back! I'm happy to know someone else has those terrifying memories. My much older 80 yr old cousin does too! Had to laugh. My backup is fresh ramen in broth, cold or hot depending on the season. Set it out, let people choose their own toppings, and you're good! That short rib snafu with Dan Barber is hilarious (though I'm sure not for you in the moment). Could he actually have said no?! This steak looks delicious. It will be my first foray at it, but it's time! Nicely written, very funny. I had the exact same short rib problem with that exact same recipe ... weird, I can't imagine what happened. 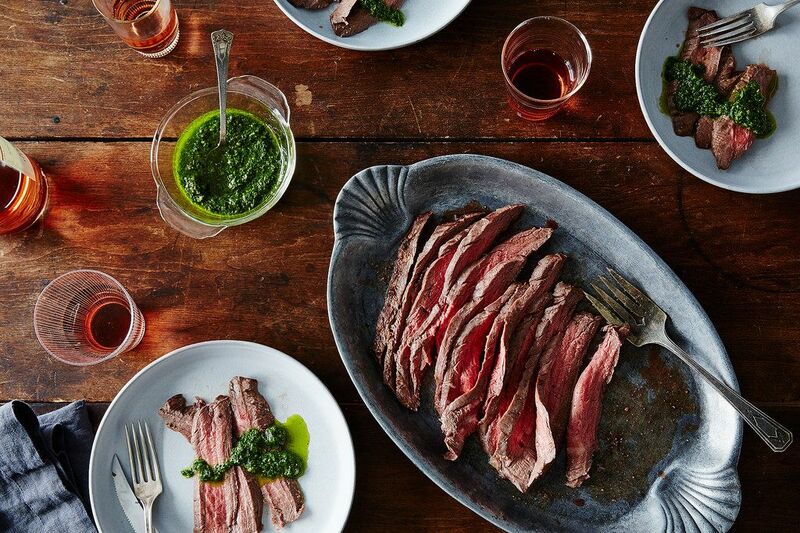 Flank steak is getting very expensive, it's become too popular! My back-up is also a side of salmon in the freezer, with lemons. Glad to know I'm not alone! Amanda - when this happens to me, my backup is a huge piece of salmon roasted simply with some sauce (or some lemons)... reassuring that it happens to everyone.